Want to know Who will win MI vs RCB game? Welcome to crix11.com. 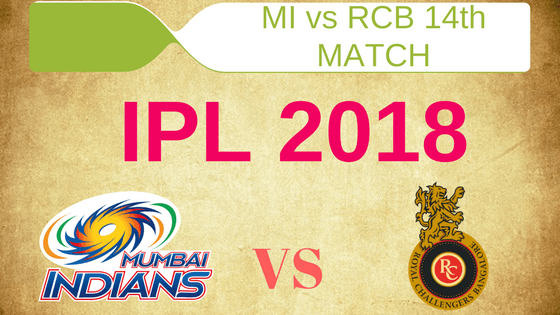 In Today’s Dream11 Fantasy Cricket Prediction MI vs RCB 14th T20 Match IPL 2018 we will give you expert and astrology tips, playing 11, pitch report of Wankhede Stadium, Mumbai, toss forecast. We will also cover players recent and past performance, playing condition, dream11 guru prediction, the best choice for captain and vice-captain, weather report of Mumbai, key players who will perform, where to watch live match of Royal Challengers Bangalore vs Mumbai Indians which will be played on 17th April and details of live streaming. Collecting this much of data and statistics is a pain in the a**s. Isn’t it? But you will get all the details here absolutely FREE of cost. Just make sure to read the whole article to get 100% benefits. The data that we provide are taken from very reliable sources. We will also provide you with some tips and tricks in between so please at least read the post once. So let’s jump into the match prediction. Where Can You Watch the Live Streaming of RCB vs MI or Channels to Watch? Who Will Win the 13th Match of IPL 2018 Between RCB vs MI and Toss Prediction? Date: The match will be played on 17th April 2018 (Tuesday). Highest total on this ground is 230/8 in 19.4 overs by ENG v SA. In IPL 2018 the pitch of Wankhede has been slow but it has a different history. Initially, the seamers get some movement from the pitch but after a couple of overs, the ground starts favouring the batsman. The pitch has a good bounce and the ground is smaller as compared to another stadium, expect high voltage drama in today’s match. Weather of Mumbai is clear for today’s match. Although in the morning there will be few clouds in the sky, most of the time the sky will be clear and you can see a sunny day. No rain is expected on 17th April. The temperature is expected to be 33-Degree Celsius and humidity to be 57% which may go up to 67%. MI won 4 matches out of 5 matches whereas RCB has only won 1 game out of 5 games. If we look at all the matches Mumbai Indians won 13 matches and Royal Challengers Bangalore won 8 games but in Wankhede, the stats are interesting RCB won three games and MI won 4 games. It will be interesting to see which team improves their record in Wankhede. Star Sports has paid a huge amount of INR 16,347.50 Crores to get exclusive rights of IPL 2018 for live coverage for five years starting from 2018 to 2022. Star Sports has all the media rights including TV and all Digital Rights. You can watch the full match of Mumbai Indians vs Royal Challengers Bangalore on Star Sports. Rohit Sharma (c), Evin Lewis, Mitchell McClenaghan, Adam Milne, Jean-Paul Duminy, Ishan Kishan (wk), Rahul Chahar, MD Nidheesh, Suryakumar Yadav, Hardik Pandya, Pradeep Sangwan, Kieron Pollard, Mohsin Khan, Jasprit Bumrah, Mustafizur Rahman, Krunal Pandya, Saurabh Tiwary, Anukul Roy, Tajinder Singh, Akila Dananjaya, Aditya Tare, Mayank Markande, Sharad Lumba, Ben Cutting, Siddhesh Lad. Virat Kohli (c), AB de Villiers, Quinton de Kock (wk), Tim Southee, Washington Sundar, Brendon McCullum, Manan Vohra, Aniket Choudhary, Mandeep Singh, Pavan Deshpande, Pawan Negi, Yuzvendra Chahal, Chris Woakes, Mohammed Siraj, Colin de Grandhomme, Kulwant Khejroliya, Murugan Ashwin, Umesh Yadav, Corey Anderson, Aniruddha Joshi, Sarfaraz Khan, Navdeep Saini, Moeen Ali, Parthiv Patel. MI lost back to back games in IPL 2018 and they will be desperate to win today’s match. On the other hand, RCB has only won one match and lost two. It will be interesting to see how both the captains make playing 11 combinations as both the teams will fight for a win. It will be a difficult decision for Kohli to choose the best playing 11. McCullum may sit and Parthiv Patel may get a game to play. This will open a space for Tim Southee. Siraj may get a game in place of Kulwant Khejroliya. Either RCB will go with the same playing 11 which is most unlikely to happen or they will go with the above possible changes. Brendon McCullum, AB de Villiers, Quinton de Kock (wk), Washington Sundar, Yuzvendra Chahal, Virat Kohli (c), Umesh Yadav, Pawan Negi, Kulwant Khejroliya/Siraj, Chris Woakes. Note: Our prediction is McCullum will play. It might be risky. Akila Dananjaya was very expensive in the previous game so MI may bring McClenaghan back in the playing 11 considering the fact that he has dismissed Kohli four times. Except Akila Rohit will go with the same playing 11 in today’s match. Suryakumar Yadav, Evin Lewis, Kieron Pollard, Jasprit Bumrah, Rohit Sharma (c), Ishan Kishan (wk), Mayank Markande, Mustafizur Rahman, Hardik Pandya, Krunal Pandya, Akila Dananjaya/Mitchell McClenaghan. Quinton de Kock: De Kock has scored 75 runs in last three matches. He scored 26 runs in the last match and contributed 21 points. 50.5% of the users have selected him in their dream11 fantasy teams. Ishan Kishan: Ishan 93 runs in the previous three games. He scored 44 runs in the last match and contributed 28.5 points. 47.09% of the users have taken him in their teams. Pro tips: Both the players are good and top order batsman. Make a combination from the above list. Virat Kohli: Kohli was in good form in the previous game. He scored 57 runs in the last match and contributed 44 points. In last 9 matches, he has scored 263 runs with an average of 29.22. 76.2% of the fantasy users have chosen him in their teams. AB de Villiers: In last three games AB de Villiers has scored 121 runs. He contributed 13.5 points and scored 20 runs in the previous inning. 78.28% of the users have selected him in their team. Rohit Sharma: Rohit Sharma is out of form but he can strike any day. He scored 18 runs and contributed 16 points in the previous inning. In the last ten matches, he has scored 204 runs with an average of 20.40. 44.54% of the users have taken him in their teams. Evin Lewis: In a ground like Mumbai Lewis can be a dangerous player. He scored 48 runs in the last game and contributed 32 points. 62.44% of the users have taken him. Brendon McCullum: If he plays, he will definitely score runs in today’s match as predicted by our cricket experts. He scored 4 runs and contributed 4.5 points. 34.03% of the users have chosen him. Mandeep Singh: He scored 47 runs in the last game and contributed 29.5 points. 29.57% of the users have taken him in their dream team. Suryakumar Yadav: Suryakumar Yadav scored 53 runs in the previous inning and contributed 37 points. 73.95% of the users have selected him in today’s match. Kieron Pollard: Pollard contributed 4 points in the previous game. In the last 10 matches, Pollard scored 182 runs with an average of 30.33. 24.36% of the users have chosen him in their teams. Pro tips: Try to make a combination of the above players. Try to keep hitters in your teams as the ground is small. A huge run is expected in today’s match. Krunal Pandya: Krunal scored 11 runs, took 2 wickets and contributed 28 points. 66.8% of the dream11 users have selected him in their team. Hardik Pandya: Hardik contributed 49 points till now. 52.97% of the users have chosen him. Chris Woakes: Woakes took 2 wickets and contributed 19 points. 68.66% of the users have taken him in their teams. Pro tips: Try to keep Krunal on your team. For multiple teams make a combination of the above players. Jasprit Bumrah: Bumrah was not that much effective in this IPL but he is a dangerous bowler. 53.67% of the users have selected him in their teams. Yuzvendra Chahal: Chahal took two wickets in the previous game and contributed 23 points. 41.53% of the users have selected him. Mustafizur Rahman: Mustafizur took 1 wickets in the last match and contributed 12 points. 62.67% of the users have selected him in their teams. Washington Sundar: Sundar scored 35 runs and contributed 23 points. 54.04% of the users have taken him in their teams. Mayank Markande: Markande took 7 wickets in last three innings. 62.07% of the users have taken him in their teams. Umesh Yadav: 46.63% of the users have selected Umesh in their dream11 team. Pro tips: The above players are most likely to perform. Make a captain and vice-captain from the above list. You can also select players from key players. Mumbai Indians and Royal challengers will play today’s match to show that they are not here to be in the bottom of the points table but only one team will taste the victory. If you go by news and cricket experts MI will win the match but according to our prediction RCB will win the 14th game of IPL 2018. In a couple of matches team losing the toss have won the game but here in Wankhede Stadium the team winning the toss will decide to bowl first. Our Astrology department says Royal Challengers Bangalore will win the toss and they will invite Mumbai Indians to bat first. Conclusion: This is it for Today’s Dream11 Fantasy Cricket Match Prediction of RCB vs MI, 14th T20 Match, IPL 2018 which will be played on Monday 17th April. You can give your valuable feedback in the comment section. Subscribe to our notification of latest updates. GOODBYE! It’s so good to hear that it helps. Thanks for being a loyal reader of crix11. Is there a app for crix11? You will find below on the left-hand side. Red colour bell icon Press that. Those teams are Demo teams. Try to make your own team from the Information that we provide in the article.